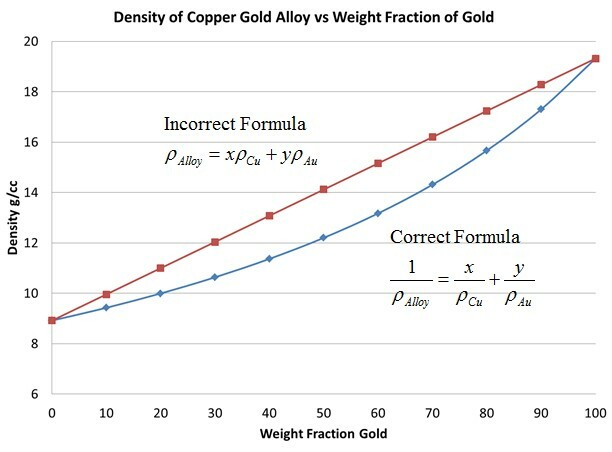 In the nearly ten years that I have been blogging, I am continually surprised by the interest in a spreadsheet I created that calculates alloy densities. I get about numerous inquiries a year on this topic. We just renewed the link to the software, so I thought I would write a summary blog on its use and applicability. First of all, the algorithm is intended for metals that form an alloy. Examples would be most solders and other metal systems where the metal atoms replace each other in the lattice. So, in addition to solders, copper and nickel would also work. The calculation assumes perfect mixing and that the sum of the initial volumes of the metals equals the total final volume. And the same for metals 2 and 3. This formula was derived in a past blog post. People are often surprised that the simple formula Da = xD1 + yD2 + zD3 is not correct. The reason it is not correct is that density is inversely proportional to volume. The error with this formula is discussed in another post. The error, by using this formula, can be quite large. See the graph below for gold and copper. In some cases the error is more than 15%. One example where the algorithm does not work would be for intermetallic compounds. The reason is that an intermetallic is a compound, not an alloy. Another example where the formula does not work is carbon in iron. The carbon atom is so small that it fits in between the iron atoms. How accurate is the formula? Work that I have performed with solder alloys suggests is it about 1-2% accurate. The accuracy can be affected by grain boundaries and the small amount of intermetallics that can form in some solder alloys. An example is the small amount of intermetallic "silver plate" (Ag3Sn) that can form in SAC alloys. I hope that many readers continue to find the density calculator useful. Math Musings: I read a fun book "The Joy of X" . In the book, the author, Steven Strogatz, pointed out that the sum of consecutive odd numbers is always a perfect square.